Early last December, as I was blog-hopping, I stumbled over a picture of Ginny dolls from 365 Dolls. 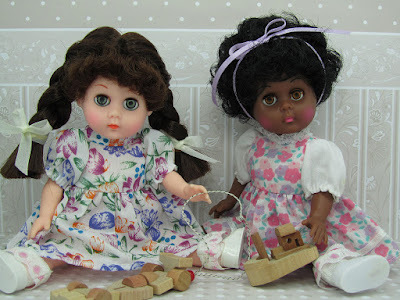 They kinda reminded me of Madame Alexander dolls though Ginny looked much more innocent to me. That familiar excitement bubbled up inside. I was intrigued and madly searched for more information online. As the story always goes, I ended up with some. Goodness knows, I couldn't just have one. Ginny dolls, based on the era they were made, seem to vary considerably in prices. And she's been around since 1951. Luckily, I'm geared towards the 80's Ginnys and they're quite inexpensive too. Those big round eyes and puffy cheeks are too adorable! Meet my very own Ginny and her friend I renamed Ember, because her eyes reminded me of small flickering flames [the reason I ended up getting her]. They've been redressed in play clothes that belonged to my sisters old baby doll [that we no longer have] whose size seems to match Ginny's perfectly. I remember snatching these dresses from my parents' basement during the move to our current house. There's actually six of them in total. Since my sister is not such a doll person, she never played with her dolls. Thus, the dresses were in never-played-with condition. I didn't want to throw them out even though I didn't have dolls that could fit into them. Three years later, they've finally been put to use. Don't you just love it when things seem to just fall into place? 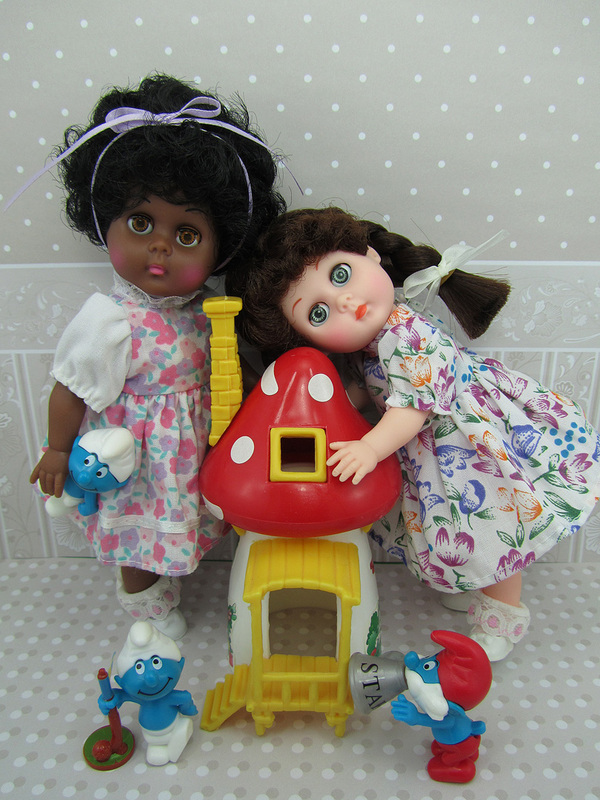 Thanks to Aunt Lou of 365 Dolls for the Ginny photo that inspired this new dolly love affair! This blog post is for you! I love them too. Saw photos of my Canadian cousins with the early ones and was a teeny bit jealous. Had to wait 50 years to have my own three cross the Atlantic to me. Loving my second childhood!